"With his second cookbook, Priebe takes on the role of pizza enthusiast, storyteller, and food historian, capturing the oral histories from the owners of famed pizzerias across the country and packaging them with his own recipes inspired by those experiences. He seamlessly weaves his easy-going appetite for storytelling with sophisticated cooking techniques broken down for the average cook." "This is a happy book . . . With The United States of Pizza in your kitchen, you are prepared for dozens of pizza nights of delight . . . Don't feel overwhelmed by all of these ideas. Just take it one slice at a time." 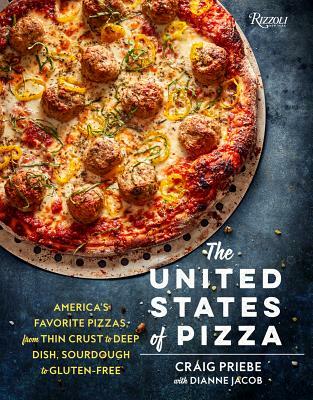 "No pizza stone goes unturned here - rather than a painstaking paean to the classic style, [The United States of Pizza] celebrates the freewheeling Americanness of pizza, reflecting the personalities of their makers and origins." "Where other pizza cookbooks would come from a single cook or innovator, this gathers the creations of chefs from across the country and also adds notes on how the authors discovered their fare. Where other pizza cookbooks would assume some basic pizza-making knowledge or provide these directions using text, The United States of Pizza uses color step-by-step photos to visually explore different techniques . . . The result is a deliciously diverse creation that assumes little prior experience making pizza dough or toppings, and requires only an interest in innovative productions to prove an exciting addition to any cook's collection." "The country's best regional recipes, in one keepsake collection." "Priebe and Jacob’s book is worth a look if only for its regional tour of American pizza styles. And if you’ve never made your own pizza, the ideas for unusual toppings (Buffalo Chicken, Spring Lamb Sausage, Shrimp Scampi, Deep-Dish Reuben with Zucchini Pickle Relish) are intriguing . . . My favorite was the shamelessly good Baked Egg and Eggplant Pizza from Dolce Vita in Houston." "[The United States of Pizza] is a celebration of a country whose pizza is as wildly diverse as its population — white clam pizza from New Haven, deep dish pizza from Chicago, crab pizza from Baltimore, and so on. They're inspired by restaurants all over the country, but each recipe is Priebe's own interpretation — which means they're consistent, and they work." "What separates [The United States of Pizza] from the pack: Each pizza is plucked from a restaurant in the U.S., with a paragraph telling its story - at once satisfying our innate love for familiarity and discovery. The authors also pull particularly interesting recipes, with chapters on sourdough pizzas, corn flour pizzas and more."